This article will help you add up what your local bills would run, “more or less”. Remember the old expression “Now Your Cooking with Gas”? Well that’s just what we do here everyday. We also heat water, dry our clothes and on rare occasion take the chill off of our homes on the few cold nights here. Some folks who don’t use solar also heat their pools with gas. When I say gas I mean propane gas, not natural gas. 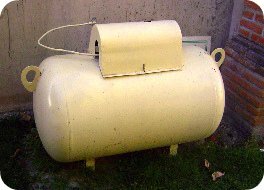 Pictured is a typical propane tank. Most couples find that their gas costs approx $25 USD per month on average. Electricity is only available from one source: the Centro Federal Electrico (CFE), a government monopoly. You must pay on time whether or not you received your bill. The bill covers two months. There are a number of different tiers in the pricing of electricity. The goal is to conserve because the more you use the more you pay PER KILOWATT HOUR. We use approx. $38 USD per month. We have two TVs on most of the time, two computers, and numerous electric appliances. Local telephone service for 100 calls per month is approx $18 USD. Telephone service is provided by Tel-Mex (a near monopoly). Many folks make do with cell phones. I rarely use my house phone. My local cell phone service is by Movie Star and I get free long distance within Mexico with my Movie Star service so I use it for pretty much all calls within Mexico including local calls. My monthly bill for my cell runs me between $23-40 USD per month (I use it a lot for business). My water is included as part of my homeowners dues, but if I lived in the city instead of in my neighborhood I would pay approx $150 USD per year for water. Dues vary from neighborhood to neighborhood depending upon the efficiency of the neighborhood association, the services provided and the size of the neighborhood (from $25 to $200 USD). In Chapala Haciendas, where I live, our dues are $50 USD per month. I receive all the water I want (no meters), street lights, twice weekly trash pickup, once weekly garden debris pickup, street repair, and extra police security patrols. We also have a bi-lingual secretary and an office open M-F, 9am-3pm. We have 3 main satellite TV firms (Star Choice, Sky and Dish) which are like in the USA or Canada as far as packages and prices go. Dial-up is everywhere in the area. Highspeed is almost everywhere. Four firms provide the High Speed service. I utilize three of the four between my office and home. At home I have DirectWay which is a direct satellite link for my highspeed and I’m also in the process of reinstalling “Mexico Wireless”. In my office I use Tel Mex’s Infinitum (DSL) which is the most reliable if you are in an area served. Another wireless provider called Laguna Net also provides good wireless service from Ajijic to the west end of the Lake. My Tel Mex DSL is highspeed and runs about $23/month. My satellite runs a whopping $83/month which includes the rental of the expensive direct uplink equipment to the satellite each month. I hope to be able to drop this when my Mexico Wireless connection is up and running well. What About Cell Phones at Lake Chapala Ajijic ? Many thanks for your great information. My husband and I are coming to Chapala in March ’09 for 3 1/2 months as an “exploritory” visit, with the idea of staying permanently if we like it there. By far our biggest concern is the availability of good, high speed internet to operate our international business. Currently here in Washington State with Comcast, we are getting approx. 36mbps. Your post is a year old, so we are hoping internet service has improved even more. What can be had currently, and what would the cost be? You are a peach if you can answer this for us. I forgot to mention that we currently use Vonage here in the states and plan on using it in Chapala as well. We find it an excellent alternative to mainstream phone service! Hi Linda and Bert, Thanks for your comments. I use Tel Mex High speed at home and Telecable (Megacable) at my Chapala Office. So, I sort of have a dual system which is good since I too use my Internet connections for business. I pay about 600 pesos or at today’s exchange rate just over $46 USD for 3 meg from Megacable. I have a package with Tel Mex at my home where I get 1000 minutes of long distance in Mexico and local telephone service and 1 meg of high speed internet for about the same cost $46. Tel Mex claims 99% uptime. Megacable is said to have 90 % but improving. Now here’s a quote from my local computer/internet guru Benno from a post he made on another web board. “Lagunanet will give you the best best bang for the buck. The upfront cost is only worth it if you are planning on using their service for at least 3 years. Telmex would be next in line beacause their service is pretty reliable, and there are probably no big upfront payments to make. The downside of Telmex is that they have to have to have an available “slot” for you to hook up to, and their internet won’t reach you until about 3-4 business days after you pay for the hook up. Telecable is very fast, but their customer service is appalling. The modems they use to get you your internet also have a tendency to overheat and crash causing you to loose your internet until it cools down. I am daily looking at your website and THANK YOU FOR ALL THE HELPFUL INFORMATION. Joe and I will be down 4/7-13/10 for a pre-move exploration. Pretty sure we have decided to come down (after we sell our home) for an indefinite stay. My question is: Cell Phones Here in DFW we use Sprint without International service. Can we purchase cell phones in Lake Chapala with the Movie Star service? Also…did you ever find anyone who has the Laredo to Chapala driving directions in a word doc? Hi Jan, Glad you’re finding being a ChapalaCLub.com member helpful. Yes, you can purchase Movie Star and other carrier cell phones here. Two basic types. On type are the ones where you open an account, choose a phone, choose a plan, and pay a monthly bill according to your plan. These plans cost you less per minute, but if use is not frequent can cost more on a monthly basis. The Second type. You purchase the phone (About $40 USD and then you buy specific amounts of credit. You can usually buy time in $8 USD increments. You buy a card which once you scratch off the black coating reveals a code number which is then encoded into your cell phone (the clerk will do it for you) and your talking. Most of the international plans from US carriers are extremely expensive so unless you’ll be doing a lot of cell phone calls to the USA or around the world it’s probably best for occasional use to just use your Mexican cell phone if you need the portability of a cell. Thank you very much for having this great website with so much helpful information. My husband and I are checking into Ajijic for retirement. I noticed that this article is dated April 2007. Would you kindly share some updates (presumably there are some) on the options and pricing for TV and Internet in Ajijic? One of our concerns is the typical requirement to sign a contract for a year or two, as we probably would be in Ajijic for only part of the year to start. What is your advice for us in this respect? Another concern of ours is about the Internet speed; in US with Verizon we are getting 25 Mbps download and upload; what is the highest Internet speed in Ajijic? For Satellite TV, you mentioned Dish; is this the “Dish Mexico” you described in another article? Do you know if they are related to the US Dish Network? The Dish Network here tells us that they would handle the satellite dish installation for us in Mexico, which we find very difficult to believe. What is your experience or opinion about this kind of offer? Many thanks in advance for your time and advice. Above all, thanks again for being so helpful! Hi Gloria, Thanks for your questions: The comments yo see published along with my responses are posted under the article the poster added his/her comments. They may be adding a comment related or unrelated to the article content. So, the comment and my answer may be much more current than the article itself. TV Options include a local Cable channel which has only limited English programing and serves a limited area mostly East and West along the highway that connects Chapala and Jocotepec. They also provide High speed coverage of 100mg or perhaps more. You have to subscribe to the TV service to get the Internet service. Prices are competitive. Tel Mex has the best up time rating and has speeds up to 200 mb advertised. They bundle their telephone service with various levels of Internet service. The least expensive bundle is 389 pesos a month for 1 mb, 100 local calls, 100 long distance calls in Mexico. At 11.5 to 1 this computes to $33.82 USD per month. I have the highest non commercial package they offer unlimited telephone calls local and long distance in Mexico and an advertised speed of 2 mb for 999 pesos or $86.86 USD per month. TV satellite coverage is available from Sky, Dish ( I assume they’re affiliated with Dish in North America) and StarChoice. The system with the most (all English perhaps with some French programing) is StarChoice out of Canada which provides all three main USA networks and Fox. The prices are all competitive with USA prices and there are a maze of options and packages. Not sure about the term of the service but as far as I know you can start and stop at will. I think you would do just as well to have the Dish folks here install a system for you. The communication between Dish there and Dish here would just an extra link. You could put “Dish Satellite in Mexico” in Google search and see what you find out. Finally, full time or part time life here is Great. I’ve done it both ways, but became a full timer as soon as I could. hi, sid grateful to speak to you. you are very kind to answer questions from everybody. i have seen some of you videos searching internet very well done. i want to move am. like eveybody with family not so easy. we live in s. cal. tired of the mess. ps. maybe you can help me out,i have 5 year old grandson ,need to be close to schools? i hope this not a problem. thanks again for help. HI Dan, Thanks for the nice words. I try to be as generous with my time as I possibly can and still have a more or less private life. SCHOOLS – We have several good private schools here which are reasonable. A few families here home school. There’s a small but growing number of Ex Pats here with younger children. As our world gets smaller each year I would see it as a big plus if more North American kids could grow up bi lingual and bi cultural. My Mexican grand daughter’s Mom speaks just a little English, but her daughter at 12 years old is bi lingual and speaks both languages without an accent. What a blessing. The public schools here focus on the basics and classes are just half a day. No band, sports, study hall, home room or long recess periods. Works well in that it allows working Moms who work half a day to be home when the kids get out of school. Uniforms are required in both private and public schools. Class sizes can often be in the 35 to 40 range in public schools and much smaller in private schools. Sid – is it possible to buy a smartphone in Mexico? If so, is it cost prohibitive; e.g., checking email, browsing, etc. ?